An upside to Hurricane Katrina and the subsequent flood was the infusion of New Orleans culture throughout our country. With the city almost completely evacuated, its people, music, cooking, way of talk and style scattered across the U.S. like seeds from a dandelion blowball. 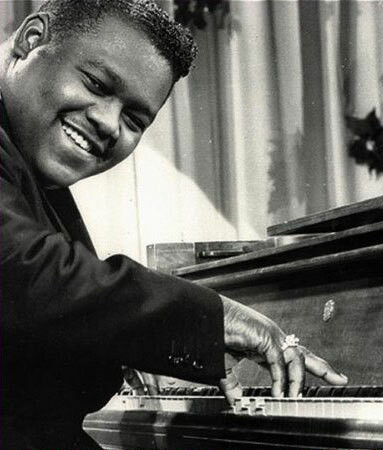 Fats Domino and his family were rescued by Coast Guard from his lower Ninth Ward home. Ward. He stayed in his home through the hurricane and was rescued by a Coast Guard helicopter. But he lost all his gold records and memorabilia. Irma Thomas – The Soul Queen of New Orleans weathered the storm and the aftermath in Austin Texas. She rebuilt her East New Orleans home and she won a grammy for her post Katrina recorded album. Dave Bartholomew – The home and studio of the man behind many of New Orleans R&B hits of the 1950’s suffered considerable flood damage but he and his family (His son Don B. is a successful hip-hop producer) have bounced back with now three generations of Bartholomew’s making music. 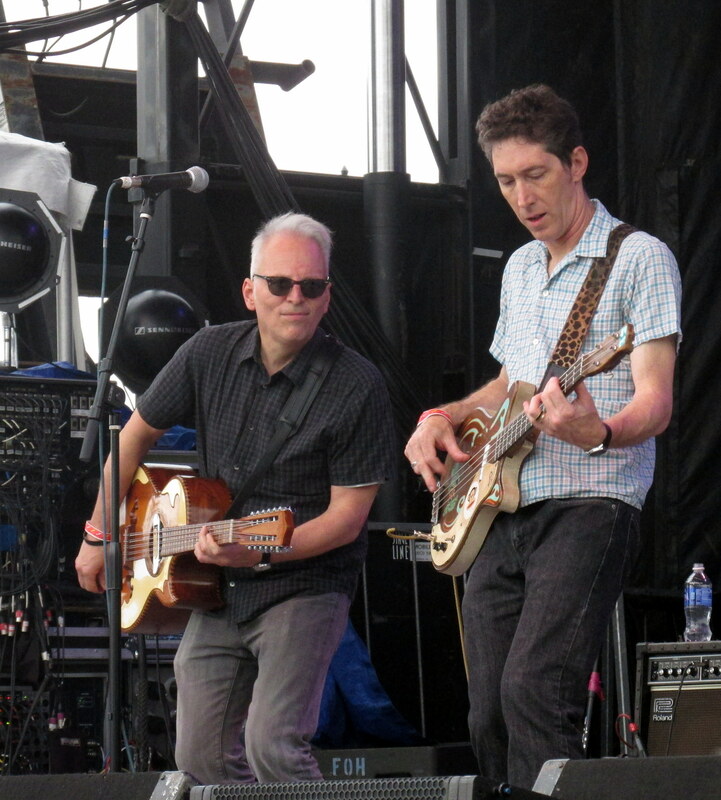 The Radiators – Once described as New Orleans’ longest running and most successful rock band are no longer an act officially–though you can occasionally catch them on special events and Jazzfest. Hurricane Katrina landed on guitarist Dave Malone’s birthday. He and his wife struggled to rebuild their home and ended up living outside of New Orleans. The Iguanas made a temporary home in Austin while waiting to return to New Orleans. 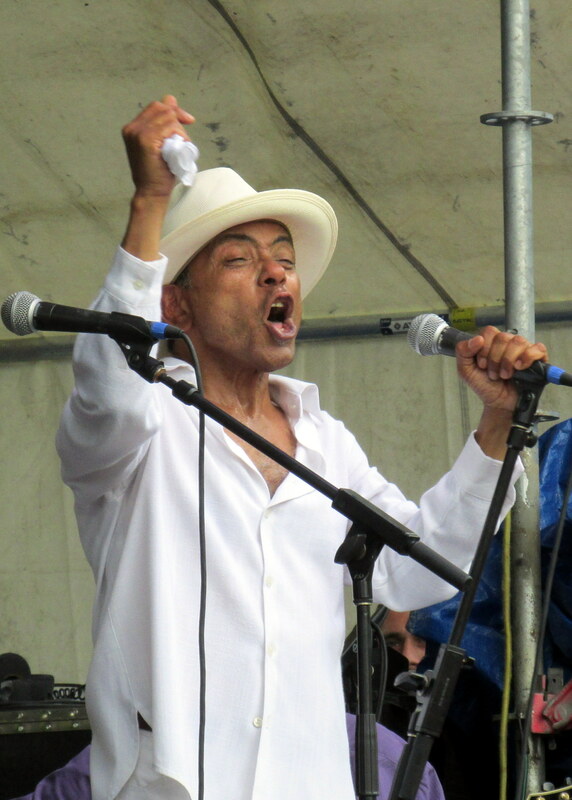 Joe Cabral (left) and Rene’ Coman performing at French Quarter Festival this year. time and separated to find evacuated family members. They regathered in Austin and became part of the flexible ensemble of New Orleans musicians known as Texiles. The band has had three CD releases since Katrina. The Hot 8 Brass Band – This innovative group could be called the Adversity Brass Band. Before Katrina, three of its band members had died — two from shootings. After Katrina, a fourth member was shot to death while driving in his car with his family. Another member lost the use of his legs in an accident. The band scattered across the country after Katrina and could easily have disbanded permanently. But it regrouped, recorded a grammy-nominated album and still perform today. Dr. Michael G. White – The University professor and clarinetist lost his home in Gentilly, including many valuable jazz documents. But he’s back in town and working as hard as ever. Henry Butler – Fortunately the talented piano virtuoso was convinced to evacuate his Gentilly home, which was devastated by flood waters. Blind since birth, he can’t tell you what the damage looked like but he can describe the feel of his piano keys as they fell apart in his hands. Last year, he and Steve Bernstein released “Viper Drag” to rave reviews and he regularly performs. Kermit Ruffins – “What good is a million dollars if you’re not in New Orleans.” The widely recognized ambassador to New Orleans evacuated to Houston with a large extended family and pets. He returned to New Orleans after the storm and continued his routine up until last year. Ironically, his wife got a job in Houston and he now splits his time between New Orleans and Houston. Donald Harrison Jr.- This lifelong New Orleans resident, Big Chief and heralded jazz saxophonist has a fear of hurricanes borne from his youthful experience escaping from Hurricane Betsy’s flood. But he stuck it out in the city cause his mother-in-law wouldn’t leave. They slept on the ballroom floor of the Hyatt Regency during the storm and aftermath, escaping to Baton Route four days later. John Boutte’ nervously watched events unfold from Brazil, finally talking one of his sisters and mother to evacuate before Katrina hit. Shamar Allen – This young trumpet player’s home was right next to a levee that broke. He now owns a home in the Musician’s Village. He contributed some key songs to the musical Nine Lives that focuses on New Orleanians who survived Hurricane Betsy and Katrina. John Boutte was in Brazil at the time and watched almost helplessly the hurricane reports from afar. Fortunately, he finally convinced one of his sisters and mother to evacuate but his other two sisters were stranded on an interstate highway bridge for five days. Terence Blanchard – Much of this jazz trumpeter’s story was told in the Spike Lee movie “When the Levees Broke.” In the documentary, you can see him and his mother enter her flood-wrecked near Lake Ponchatrain. Blanchard wrote the score for the documentary and won a grammy for subsequent album he released. Last week and this week, I’m honoring the survivors of Hurricane Katrina who dealt with intense horror, long hot days, and many months and in some cases years of uncertainty about their future. And yet, they returned to New Orleans, their home and rebuilt. Last week’s Katrina show here and this week’s show. This entry was posted in Hurricane Katrina and tagged Dave Bartholomew, Dr. Michael White, Fats Domino, Henry Butler, Hot 8 Brass Band, Irma Thomas, John Boutte, Shamar Allen, Terence Blanchard, the Iguanas. Bookmark the permalink. 2 Responses to Hurricane Katrina scattered New Orleans music across the U.S.